Hello My names Jesse. This is my first post here. @s2jesse on instagram to see the weird stuff i make.. anyway..
Im working on designing my first flashlight. I’ve settled on about 1” x 3.5” so threads will be 7/8 however I’m curious what everyone’s preferred thread tpi is. I’m deciding between 7/8-20, 7/8-24, and 7/8-32. This will be Grade5 Titanium . Titanium likes to gall with some threads. Thanks guys.. So much great info on this site. Welcome to BLF! I don’t have the answer to your question, but I wish you all the best on your project and I am looking forward to seeing the results on here. Hi and welcome Jesse. I’m not on Instagram so feel free to post pictures here. I hope you enjoy your stay, s2jesse! Where are you in NorCal? up in santa rosa area. Thanks guys i made a little progress. I’ll probably start an acutal build thread but heres the first little protopart. 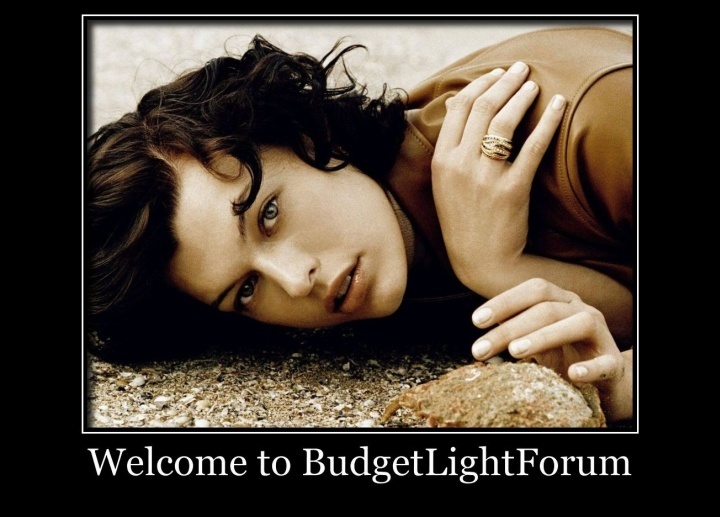 Are you going to produce lights for sale or only for your own? BTW, the design (external) seems close to the FW3A, but is different internally!! Thanks i just love making stuff. Might make a few to sell but just trying to make my self one first. Once i have the design figured out im gonna move to titanium. I might even dive into rolling my own driver too just for the fun of it. There already seems to be so many good ones out there tho. Hi and welcome Jesse. I'm an old fart and am not on Instagram so feel free to post pictures here. Me too. Pics are great. Hi and welcome Jesse. I’m an old fart and am not on Instagram so feel free to post pictures here. Looks nice. When you finish it I will buy one from you for the wife. I just have a request. Can you make the threads on the tail cap reversed? I would love to see her go crazy every time she has to change the battery. Also I need the modes to run Strobe-High-Strobe-Med-Strobe-Low-Strobe-Firefly. With next mode memory. This is great, Love seeing stuff like this! Nice work, give us MORE, Please! I’m just starting. I don’t have the equipment at home, so at work I have break time and lunch time to use the lathe, mill and other equipment. 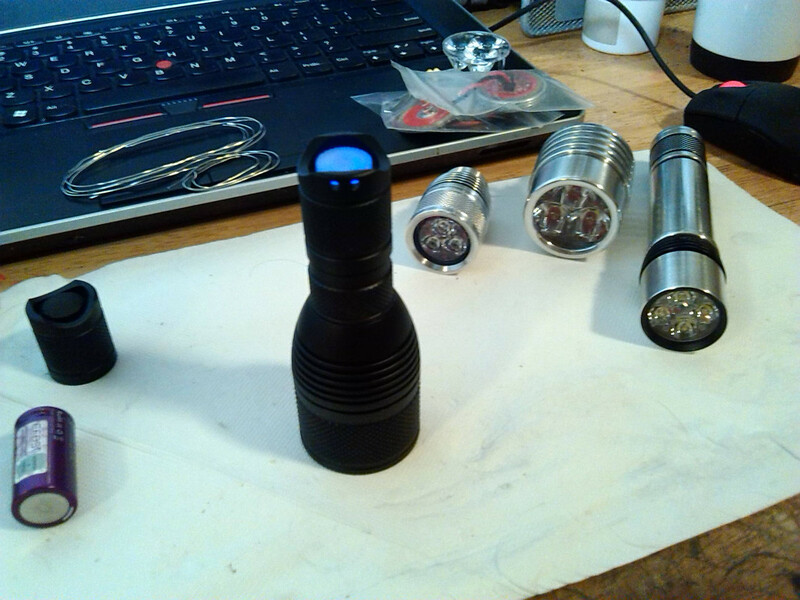 The lights on the right are modded X5/X6 with 7/8-20 threads that I can interchange with this simple battery tube, the bigger triple I made from scrap pieces. There is some crazy talented master machinist in this community and I can’t wait to see what they and you come up with next! You could try using metric thread standards, as everyone else in the World does. 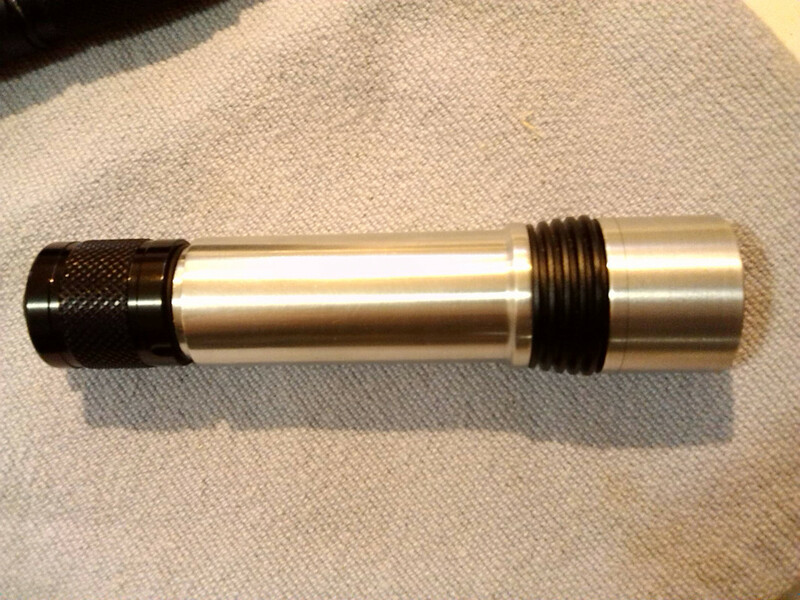 As long as your lathe lead screw and change gears are compatible. If not, change it to one that does work. No, this is not a joke. It really does matter, and makes life so much easier. Metricate, and join the the rest of the World, instead of living in an incompatible domestic bubble based on ancient British imperial measurements. Very nice looking work, by the way, however it is threaded. Ok It’s been quite a while but here is a big update on where I’m at. It’s coming along quite nicely i think. I settled on 7/8 -28 threads. They seem like agood balance between speed and feel. Im calling it the Citadel . Im also really toying with the idea of my own custom driver. I’ll have to get some other threads going there. I just saw this thread today. Welcome, from just up the 101. 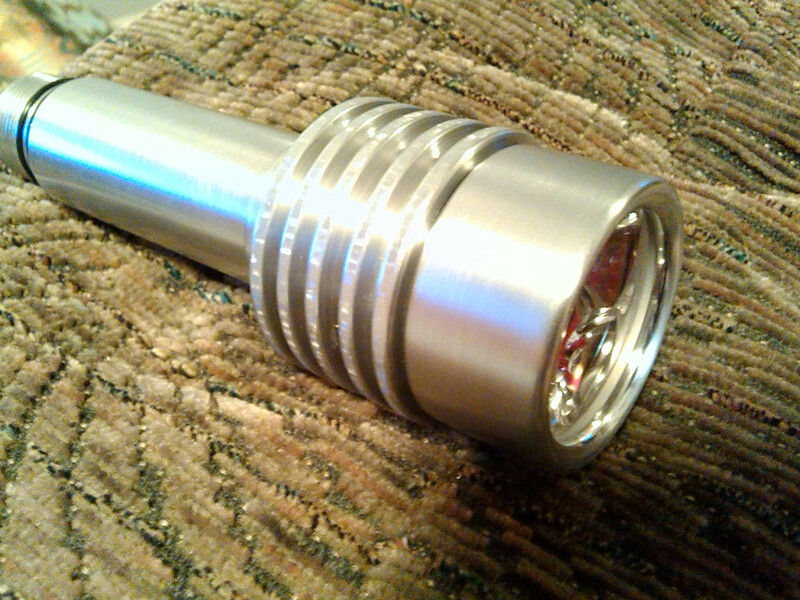 There is overkill, way overkill and then there is Grade 5 titanium for a flashlights. Are you planning for the next extinction level asteroid hit? I made molds from that stuff and sold my soul to the devil to buy it. Hey, don’t get me wrong, I’m…..I’m jealous! awesome yep just in sonoma county myself. probably impossible – but could you make some kind of coarse jar-thread type thing for the cap? what i don;t like is, having to turn the thing 4-5 times for open and close. i want something like a baby-food jar. half a turn and it;s closed! plus, additional advantage, the threads would start in 3-4 places, so you don;t have to turn it backwards 2 or 3 times to find the start of the threads. Don’t lathes have standard thread patterns? Even for Acme threads?